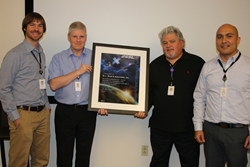 W. L. Gore & Associates, Inc. (Gore) has received a Supplier Appreciation Award from Space Systems Loral (SSL) Palo Alto, CA, the leading provider of geostationary commercial satellites, in recognition of Gore’s dedication in supporting SSL programs. Gore consistently provides high quality and rapid turnaround for cable assemblies – always meeting critical deadlines for satellite launchpad dates. SSL has a long history of producing reliable satellites and spacecraft systems for commercial and government customers around the world and currently has more geostationary commercial capacity in orbit than any other manufacturer. Gore has been providing SSL with its high-reliability GORE® Spaceflight Microwave/RF Assemblies for more than 20 years. The supplier appreciation award recognizes the dedication of Gore’s employees and management in supporting SSL programs. “We are in rare company to receive such an award out of the many hundreds of suppliers working with SSL,” added Kim Stanyard, Gore Field Sales Associate, who has been working closely with SSL. Space Systems Loral (SSL) is a leading provider of commercial satellites with broad expertise to support satellite operators and innovative space related missions. The company designs and manufactures spacecraft for services such as direct-to-home television, video content distribution, broadband Internet, mobile communications, and Earth observation. As a Silicon Valley innovator for more than 50 years, SSL’s advanced product line also includes state-of-the-art small satellites, and sophisticated robotics and automation solutions for remote operations. For more information, visit http://www.sslmda.com.